If you're interested in outdoor cooking, then my Barbeque or Barbecue or BBQ (depending on where you're from) blog is chock full of information on all kinds of tips, ideas, and recipes for grilling, smoking, dutch oven, and pit cooking. 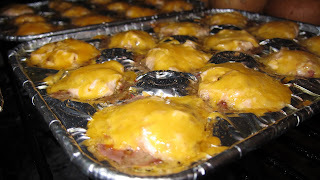 I was in the mood for something sinfully delicious this weekend and decided to make some grilled meat muffins. As I thought about how I'd do them, I decided I wanted kind of a taco flare and also cheese (since my youngest son is a huge cheese fan). I picked up a couple of the toss away mini muffin pans at IGA. I need to keep a look out at Good Will for the mini size. That's a good place to get inexpensive pans to use on the grill. They get smoked up, so I don't want to use my kitchen pans (other than old fashioned cast iron) on the grill, because I have already made quite a mess of one baking dish. To make the base, I used between 1 and 1 1/2 pounds of ground beef (ground turkey would also work fine) mixed with 3 tablespoons of taco seasoning. You can use any brand, but I used Lucky A by Lucky's Smoke House. It's a premium mix and excellent. 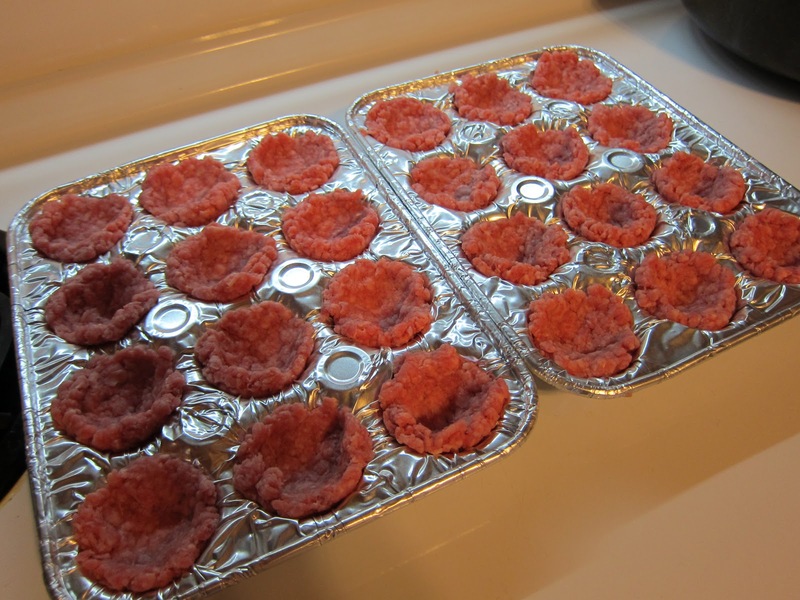 Next, I rolled the meat into 24 balls about quarter sized and used my thumb to press each in a muffin tin hole as you see here. After I got the ground beef in the pans, I mixed up the filling. 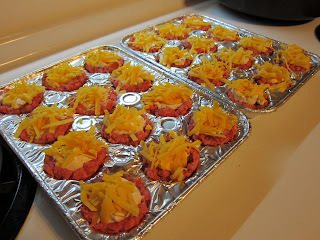 Here is what goes in the filling for the meat muffins. 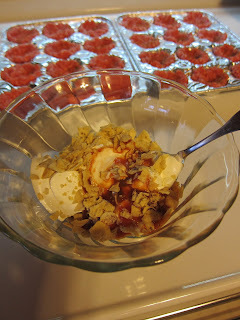 After I got everything in the bowl, I stirred the stuffing mixture so that it was smooth, and then I put the sour cream mixture in the meat muffins which you see behind my bowl. Here is what my meat muffins looked like as I was filling them with the sour cream mixture. I topped off the Tex-Mex meat muffins with shredded cheese. I used around 3 ounces which I shredded myself from a bulk block. You can also buy the cheese shreaded. 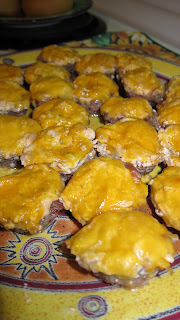 Although this doesn't sound or look like a lot of cheese, on mini muffins, these were actually quite cheesy I must say. I put the meat muffins on the grill on medium heat (around 350 degrees) with the lid down so that the grill acts basically as an oven but holds in the smoke. At this temperature, it took around a half hour to grill the meatballs. You can check but using a spoon and tilting one to see if the meat is done as you like it. You also can still see some pink above which told me that I needed to grill them a bit longer. 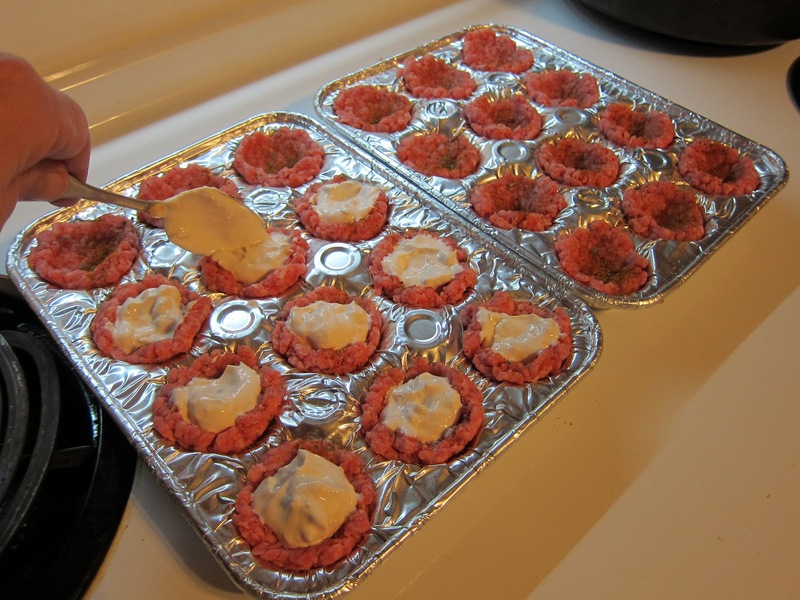 Once the mini meat muffins were done, I used a grill glove and brought the pans in the house. I used a slotted spoon to take them out. Ground beef does have fat, so I did that to get the fat drained out. These were quite delicious I must say. They had some zip with the taco powder and taco sauce. The chips gave the filling a little more body and texture, although you don't taste taco chip chunks. The inside is smooth in the end but with body. There were only three of us eating, and we did not have a single meat muffin left. So, I'm sure we'll be grilling these again. Great appetizer for the upcoming basketball tournament games! Totally agree on not using fancy cookware for the grill since it is just going to get smudged up anyhow. I've been writing online for about 14 years now. I do all types of writing, but barbecue blogging is my hobby area where I relax and have fun. How to Grill a Ham - Easy and So Yummy!